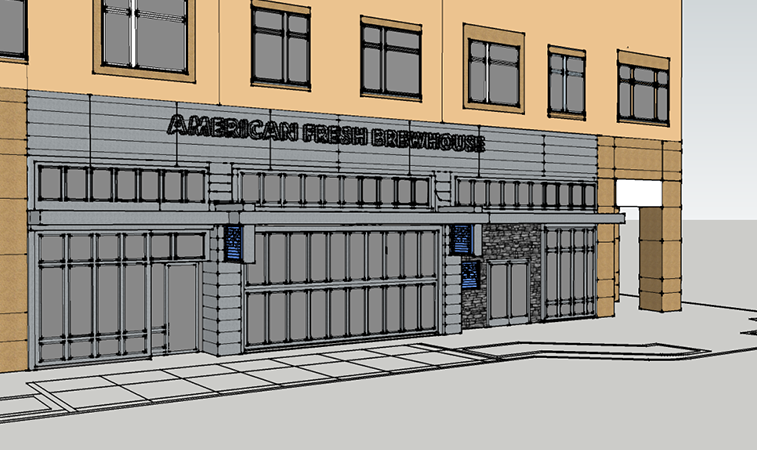 Somerville Brewing Company is expanding its American Fresh Brewhouse concept with a third location – their second at Somerville’s Assembly Row development. This coincides with tremendous growth the company has seen for its Slumbrew line of craft beer, and overall support from customers who have grown to appreciate inventive full flavor beer paired with unique food offerings at their existing retail locations. The new venue at 490 Foley Street features a small brewery at the heart of its 3,600 square foot area, surrounded by an industrial aesthetic which is a nod toward the main brewery in Boynton Yards, Somerville. The location, across from the Assembly Row T stop, will also offer outdoor seating in café tables under umbrellas. With 20 draft lines, the new brewery will pour a range of unique styles and flavors produced at the Boynton Yards brewery, as well as special experimental beers brewed right on site at Assembly Row. “Our mantra with American Fresh Brewhouse is to focus on Fresh. For most of our beer, from hoppy IPA’s to porters, and even our fan favorite Happy Sol blood orange hefeweizen, it’s always better when customers consume the finished product within days or weeks of when it’s made for the best flavor. With American Fresh Brewhouse, we plan to expand our company laterally so more people can enjoy our beer as close to its packaging date as possible, and in an atmosphere that reflects the spirit of its production”, says Jeff Leiter, Co-Founder, President and Head of Brewing. The American Fresh Brewhouse is a product of the enthusiasm consumers have brought to the recent renaissance in beer production. “People naturally want to share their passion for high quality, fresh beer while socializing with friends over a great meal at the local brewery. This is the basis for our entire philosophy in the beer business – make good liquids, make good friends”, says Caitlin Jewell, co-founder and CMO for Somerville Brewing. “We believe beer is a catalyst for communities to develop lasting social interactions, and so we provide a place for everything to come together: great beer, delightful cuisine and good times with friends.” Somerville Brewing has always seen its Slumbrew beer and taproom locations as an integral part of the community – it’s Happy Soles running club has grown to nearly 1,000 members from the local area and the existing taprooms are a frequent destination for fundraising/charity events sponsored by local patrons. The new location at Assembly Row will leverage a built-in resident community as a way to reinforce authentic lifestyle living in the mixed-use center. Expanding to a new building at Assembly Row also marks a pivot in how American Fresh Brewhouse incorporates the culinary side of its beer business. This space will feature a full kitchen, two chefs and culinary staff that work to create meals and small dishes that pair, complement and support a range of flavors from the fermented offerings. “This is an evolution of the idea of ‘brewpub’. To be relevant to what customers desire, we are more than just a place for a pale ale, burger and fries because we serve an audience that wants to try new flavors as well. Craft beer enthusiasts are very sophisticated so we strive to constantly satisfy their flavor curiosities.” says General Manager, Tim Florentino. The existing two locations also combine flavorful beer and meals to round out customer’s experience, but in slightly different formats. The American Fresh Beer Garden features an all-year patio area, also located at Assembly Row. Patrons enjoy many Slumbrew beer offerings with family-friendly, fast-casual dining, and an assortment of games and live entertainment on weekends. In the winter, the Beer Garden is covered with a heated tent and in summer, it’s an outdoor destination. Meanwhile, the original American Fresh Brewhouse and brewery location is located in the Boynton Yards neighborhood of Somerville, near Union Square. The brewery provides a full menu of items such as charcuterie, sandwiches, pizza and other specialty dishes that complement around 18 beers on tap. The limited size of its kitchen did not hold back experimentation on the food menu, but the new Foley Street Assembly Row location will certainly provide greater opportunity to expand into a culinary destination. Along with diverse draft lines and dedicated rotating cask beer, the Foley Street menu will feature full meals, small plates, brunch on the weekends and early morning breakfast offerings for commuters. The location is scheduled to open in late spring 2017.